That’s me, being entirely too cute. 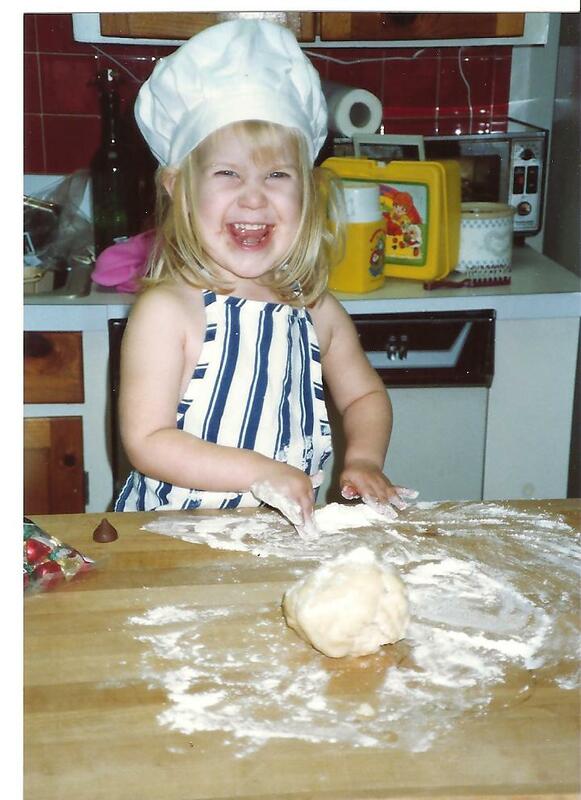 I started out in the kitchen way before I could read a recipe or reach a counter. I’d stand on a chair pulled up to our island counter, stirring a bowl of flour with water when my mom was following a real recipe. I look just about the same now (though with some clothes! ), with the same floury mess and huge smile in the kitchen. It’s because of my mom that I love being in the kitchen as much as I do. 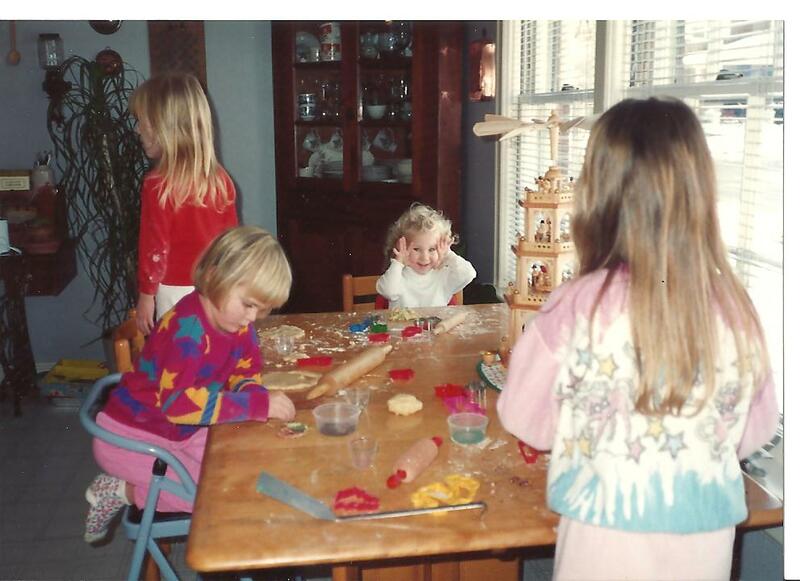 She always had her two little blonde girls, plus assorted neighbors and friends, at the counter or tabletop. 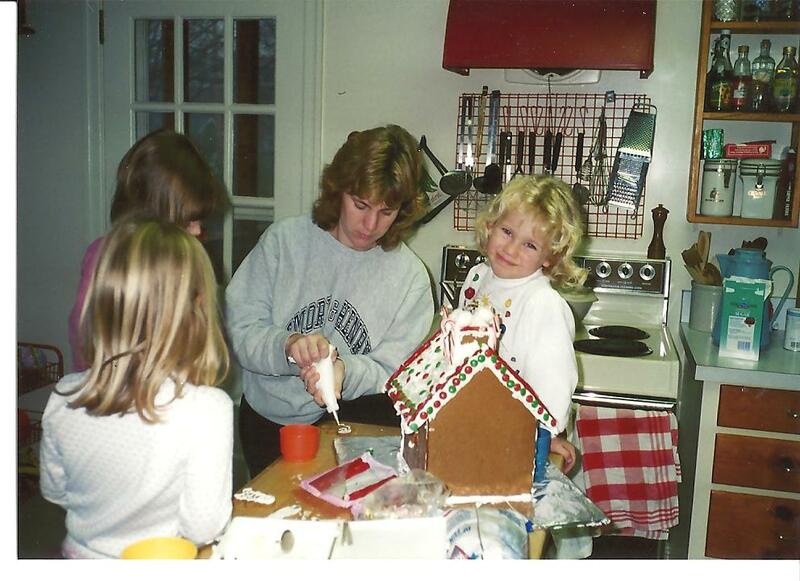 We’d make gingerbread houses, Christmas cookies, cakes and cookies. We made lots of cookies in our little Avenel Avenue kitchen. We also ate lots of dough, I’m sure. My mom helped us look through cookbooks to pick out recipes. We still love a simple oatmeal pancake recipe from a flour company’s cookbook. I need to make a copy of that next time I’m home. I found a chocolate chip banana roundabout cake in a cookbook at the library, and I even have a copy of that in my recipe binder today. Kathleen and I met as infants, and now we’re still friends! And she just graduated from JMU last week! Congrats! My mom scanned in these old pictures last week so that I could include them with a story in the Free Lance-Star. 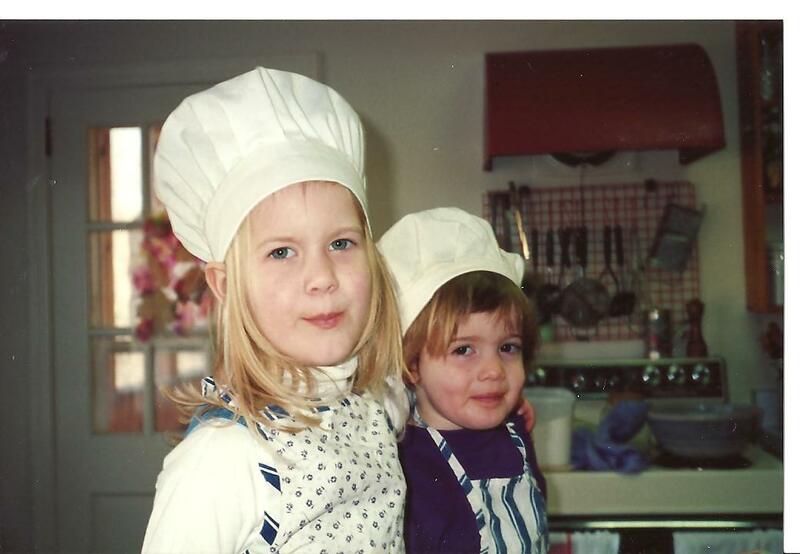 In honor of Mother’s Day, I wrote about our Tuesdays with Dorie baking challenge—and how she instilled us with a love of fresh food when we were just tiny things. Here’s my story. Happy Birthday, Mom! 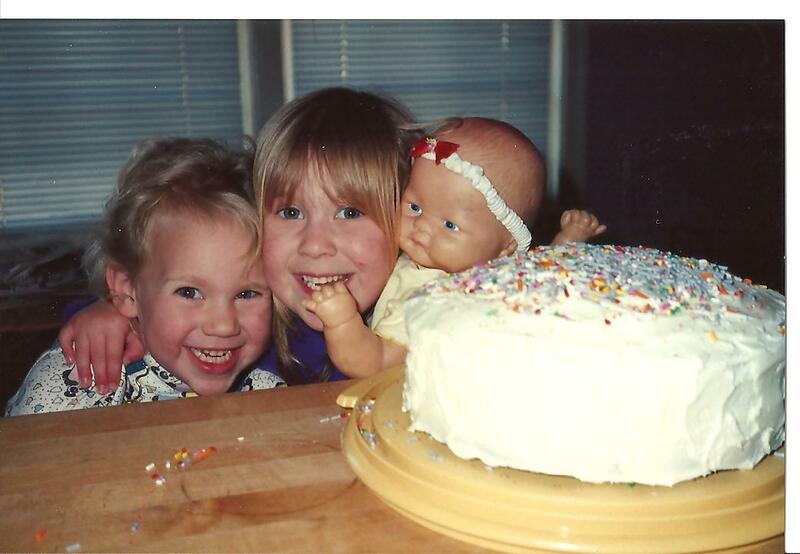 Emma and I decorated a cake for her in March 1993, along with help from my baby doll, Hollywood. Happy Mother’s Day to all the moms out there, including mine and my two grandmothers. Thank you for teaching us what you know in the kitchen: how to make pancakes in the shape of our initials; that it’s okay to get a little (or a lot) messy in the kitchen; that jam and applesauce is always best when you start at the farm; that a squirt of lemon can fix just about anything; and most importantly, how to have fun while nourishing ourselves and those we love. Thank you for being a great mom. Mix dry ingredients with whisk. Add rest of the ingredients and beat until smooth. Grease heated griddle. Pour about cup for each pancake. Cook until pancakes are puffed and dry around edges, flip and cook until other side is golden. Pour into letter shapes for an even better breakfast. Serve with syrup or applesauce. That’s what my mom noted on her recipe. ‹ PreviousHow does your garden grow? Next ›Bring a dish, it’s a wedding! Thanks for being such a great daughter! I love you! And Grace is helping in one photo!